When publishing documents, you might need the last page that forcibly must be on the outside of the book or publication for esthetical or layout reasons. Eg, company logo or contact details that should not be held at the 'inside' page of a book. But from the simple mathematical point of view, as soon as you have more than 2 pages in a book or leaflet, page 1 and the last even page are on the outside. So if your last "printed" page is odd, it's sitting at the inner side of the last leaf. Word has an interesting function to use "field codes" that can solve the issue for you by adding a page break to an odd-paged document. This function has been discussed before in many blog posts, but from the descriptions, it might not be too easy to get it working. Because there are some tricky things to fix. Where [PAGE BREAK] must be replaced with CTRL+ENTER. Do NOT copy and paste the entire code block, this will fail. You need to create the code block first and then add the sections into it, manually. Between 2nd } and 3rd} = 0 "option true" "option false"
If before-last is odd, then add a message then add a page break. You might recognize this method, where documents have added a "note" page, just before the last page (remember the last page on the strong>inside of the book). To add a break line, don't type the text, but use the CTRL+ENTER function. Make sure that that the "heading 1" is set to use a "page break before" paragraph setting. If not using the "page break before" in the heading, you'll need to add an additional page break manually to keep the last page separate. The most well known phrase for this function is "This page intentionally left blank"
The field codes allow to add a "conditional page break", so you ONLY add a page break IF you need to. When using a section break (odd or even page) you ALWAYS add a page break, but you might end up adding 2 pages to the next odd or even page. Check the download section below, you can find a sample in the TN Gallery. The configuration is simple, add a section break (even page) before the last page. Below you'll find some additional tips, you might need to get the field code in place. 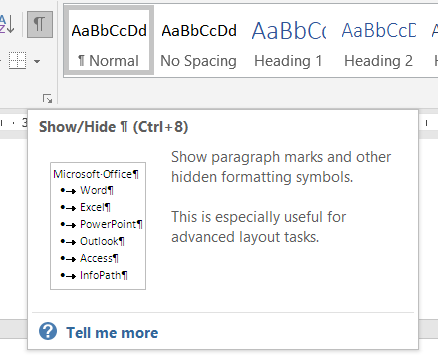 Use CTRL+8 to hide or show formatting symbol. This method is usefull to see layout and non-printable context, like page breaks. Use the <ALT+F9> shortcut to show or hide the Word field codes functions, it shows "the source" code. You'll need a view on the source code to edit it. Use the <ALT+F9> shortcut to show or hide the word functions and their value. This function can show you the value of functions, sub-functions or entire field codes. To add a page break (manually), use the CTRL+ENTER short cut. Also when you need to add a conditional page break, you'll need this short cut, because adding the text [page break] won't work. This is where a lot of people fail to implement the conditional page break function. Make sure to update the calculation functions when printing. You can set this option in the Word options. It's important to update the TOC and the conditional page break to be updated before printing. You can update the fields manually, but it's way easier to have it done automatically. An additional advantage is that the page preview will be showing you the final result, so it's a pretty handy function to test the code.